I've been serving on the Georgia Picture Book Award committee this year, and this past weekend was the culmination of months of effort. Having read dozens and dozens of picture books for potential nominees, and debated with committee members, we presented our final list of 20 books at the Georgia Children's Literature Conference. These books will then be read by children all over the state who will cast their votes and make the final determination as to the winner. Below, I've listed the five books that I presented at the conference... you can read the complete list on the newly revamped Georgia Children's Book Award website. 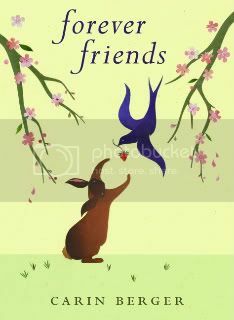 A blue bird and a bunny form a fast friendship. Over the course of the year, they enjoy spending time together, until the fall, when blue bird must fly south for the winter. In the spring, they are joyfully reunited, with another pleasant year ahead of them. Berger’s collage technique uses sharp, precisely cut, paper with found media to strong effect. Short declarative sentences, paired with several pages of wordless frolicking make this book a natural for very young audiences, although the classic theme of friendship despite their obvious differences makes this book valuable for all ages. A young girl in an small village in Thailand marches to the beat of her own drummer, and stays true to her vision. While it's traditional to paint flowers on umbrellas, instead Noot sees elephants -- beautiful elephants! -- marching across her delicately painted umbrellas. 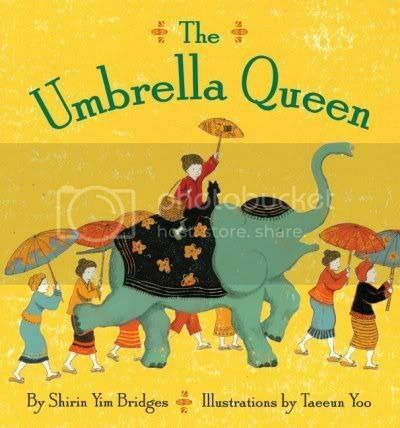 When the emperor comes to visit (riding an elephant), he's intrigued by Noot's tiny umbrellas that he spies in a window and declares Noot as that year's Umbrella Queen because she paints from the heart. Yellow, orange, blue lineleum prints with pencil illustrations lend a sunny and joyful air to this book. 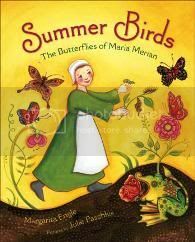 An inspiring story about a young female scientist, Maria Sibylla Merian, who in the 1600’s overturned years of medieval thought about the origin of butterflies, then known as ‘summer birds.’ Through simple observation she discovered the process of metamorphosis from caterpillar to butterfly. Beautiful painted illustrations inspired by medieval woodcuts in bright, rich colors are paired with an appealing, easy to understand text. "Today as a result of [her] careful studies, we know that butterflies, moths and frogs do not spring from mud. We also know that they are not evil, but natural and amazing." This book is everything one could hope for in a picture book biography, distilling the life of the subject into a few passages of beautifully sweet, lyrical prose celebration. Helpfully appended with additional biographical information, photographs and a bibliography this book features warmly hued watercolor and charcoal illustrations masterfully paired with informative and rhythmic text. A triumph. "Big. Black. Beautiful. True./That was Sojourner... Down came Sojourner’s hand, an iron fist, smashing the lies of the day." 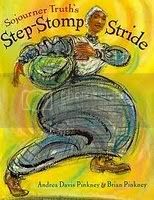 An inspiring look at a famed American abolitionist. A young boy proudly shows off his barrio, where the preparations for the celebration of his beloved older sister’s quincenera are well underway. 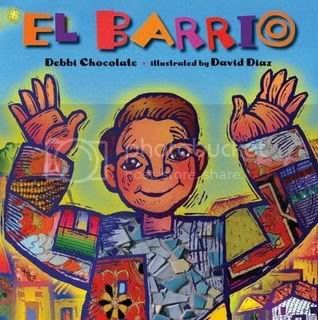 "This is el barrio!/My home in the city/with its rain-washed murals/and sparkling graffiti." Diaz’s trademark illustration style with bold black outlines and luminous color uses woodcuts, painting and collage to capture the feeling of stained glass windows. Whether this neighborhood is as familiar as home to you, or an exciting, vibrant place to visit, Chocolate’s words convey a strong sense of the community of "Aztec eyes and Mayan faces" in el barrio. Thank you for following Read.Chat.Love! We are following you back now! Make sure you swing by on March 10th at 7:00 PM EST for a chat with debut author Jennifer L. Armentrout! We will be doing trivia and giving away swag! Please check the website for more details! Wow, thanks, I don't recall following you guys, but thanks for stopping by anyhow.